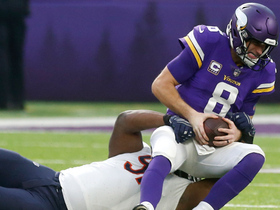 Hicks notched 1.5 sacks along with three tackles in the Bears' Week 17 victory over the Vikings, finishing the season with 55 tackles, 7.5 sacks and three forced fumbles. Analysis: Hicks has been incredibly consistent in his three years with the Bears, as he's posted between 53-55 tackles and 7-8.5 sacks in each campaign. 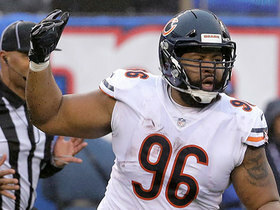 With three years remaining on his contract, he should continue to be a centerpiece of the Bears' defense and a strong IDP at the defensive line position. 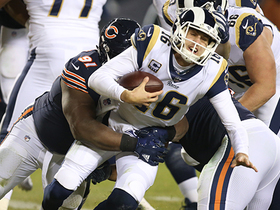 Hicks registered a sack and three tackles in Chicago's Week 14 win over the Rams. Analysis: After not collecting a sack in five straight games, Hicks now has one in three of the last four contests, and fantasy owners should ride him during this hot streak. 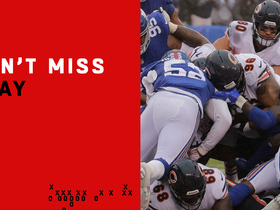 Hicks rushed for a touchdown while adding a sack and six tackles in Chicago's overtime loss to the Giants on Sunday. 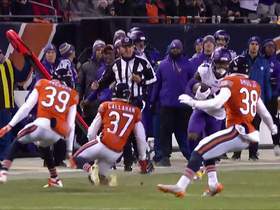 Analysis: With the Bears trying to get a much-needed score at the goal line, they handed the ball to Hicks, who dove into the end zone to help the team get the game into overtime. Otherwise, he notched his fifth sack of the season, and his ability to get to the quarterback is where most of his fantasy value will be derived. Hicks (Achilles) is active for Sunday's game versus the Giants, Rich Campbell of the Chicago Tribune reports. Analysis: Hicks has been an excellent asset to the Bears' top-ranked defense, making 39 tackles, four sacks and forcing three fumbles. Hicks will have a good chance to get to Giants quarterback Eli Manning, who ranks second in the league with 38 sacks. Hicks (Achilles) is officially listed as questionable for Sunday's game against the Giants. Analysis: Hicks was a full participant in Friday's practice after having been listed as DNP on Wednesday and Thursday, but his status for Sunday's tilt against the Giants remains in question. The veteran defensive end does not appear to be nursing an injury of long-term severity, but the Bears could opt to take a cautious approach to Hicks' health due to the nature of Achilles issues and rest him Week 13. If Hicks does not suit up, expect Bilal Nichols (knee) to benefit from a starting workload. Coach Matt Nagy said Thursday that he is "not concerned" about Hicks' Achilles injury, Jeff Dickerson of ESPN.com reports. Analysis: Hicks did not practice to begin the week and is not expected to do much work Thursday, but Nagy called his absence "precautionary." It's good news that Hicks doesn't appear to be dealing with a long-term injury given how severe Achilles issues can sometimes be, but his status for Sunday's tilt against the Giants is nonetheless murky at best. If Hicks were to remain sidelined for any amount of time, Bilal Nichols would be expected to slot into the starting lineup. 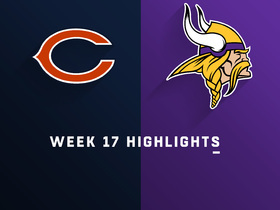 Hicks notched a sack and six tackles in Chicago's 25-20 win over the Vikings on Sunday. Analysis: After collecting three sacks in the first four games of the season, Hicks broke a five-game sack drought. Of course, two of those sack-less games occurred when Khalil Mack was out of the lineup. Look for Hicks to be a solid IDP the rest of the way while opposing offenses worry about Mack, which will allow the former to generate pressure on opposing quarterbacks. Hicks was ejected from Chicago's Week 4 victory for bumping an official. Analysis: Before his ejection, Hicks was able to collect a sack and a tackle, which at least gave him strong fantasy value despite his lack of snaps. With three sacks in four games, he's a strong weekly IDP option. After this week's bye, he'll face the Dolphins in Week 6. Hicks notched a sack and four tackles (three solo) in Chicago's 16-14 win over the Cardinals on Sunday. Analysis: Hicks now has two sacks on the season, and he's continued to be a strong IDP since joining the Bears in 2016. With Khalil Mack in town, Hicks stands an excellent chance of topping the career-high 8.5 sacks he posted in 2017. Hicks recorded a sack and three tackles in the Bears' Week 1 loss to the Packers. Analysis: Hicks has proven to be an excellent pass rusher over the past few seasons, but with the addition of Khalil Mack, he'll be in position to have a career year. It was clear in this contest that with defenses focusing on slowing Mack, Hicks will have plenty of one-on-one matchups to exploit when rushing the passer throughout the course of the season. Hicks (knee) was not on the Bears' injury report Tuesday, Colleen Kane of the Chicago Tribune reports. Analysis: Hicks missed some time during the preseason due to a sore knee, but it appears to no longer be an issue with the regular season approaching. He should start at defensive end for the Bears in the opener, looking to build off of a career-high 8.5 sacks in 2017. Hicks (knee) is being held out of Saturday's preseason game against the Chiefs, Kevin Fishbain of The Athletic reports. Analysis: Hicks has been nursing a sore knee for the past couple of days, and the Bears are likely averse to risking their starting defensive end's health in a game that is ultimately non-consequential to him. With Hicks out, look for Bilal Nichols and Roy Robertson-Harris to see additional snaps with the first-team defense. Hicks is day-to-day with a sore knee, Colleen Kane of The Chicago Tribune reports. Analysis: The Bears' next preseason game is Saturday against the Chiefs, but expect the team to be cautious with Hicks, who logged 54 tackles and 8.5 sacks in 2017. If the 28-year-old can't go, expect Bilal Nichols and Roy Robertson-Harris to see additional snaps in the third exhibition contest. Hicks collected three stops in the Week 17 loss to the Vikings and ended the season with 54 tackles and 8.5 sacks in 16 games. 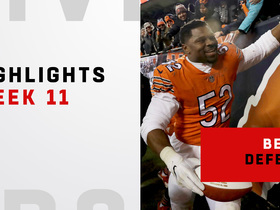 Analysis: Hicks set a career high with 8.5 sacks, he now has 15 sacks in his first two seasons with the Bears after having collected just 9.5 sacks in his five years in the league before heading to Chicago. The veteran had a great first half with seven sacks before going into a five-game drought, but he'll continue to be a solid, though not elite, IDP option as he heads into the third year of a six-year contract with the Bears. Hicks notched a sack and four tackles in Sunday's 20-10 loss to the Lions. 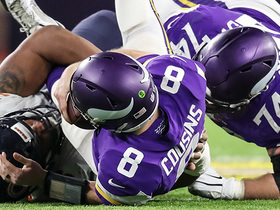 Analysis: After having collected seven sacks over the first eight games of the season, this was the first time that Hicks got to the quarterback in any of his last six contests. Although he's been an outstanding defender for the Bears, his second-half slide has made him a difficult player to trust in fantasy lineups. Hicks (knee) is active for Sunday's tilt against Philadelphia, Dan Wiederer of the Chicago Tribune reports. Analysis: Hicks sat out practice Wednesday and Thursday with the ankle issue before taking part in a limited Friday session. Though he's been given the green light to play Sunday, Hicks could be see his reps capped during the contest. The Bears activated John Jenkins for just the third time all season to provide added depth along the defensive line in the event Hicks can't take on his usual workload, according to Rich Campbell of the Chicago Tribune. Watch Chicago Bears defensive tackle Akiem Hick's best plays in the 2018 season. The Chicago Bears defense powers its way into the backfield and takes down Minnesota Vikings quarterback Kirk Cousins near the goal line. Los Angeles Rams quarterback Jared Goff is enveloped for a sack on a key fourth down. 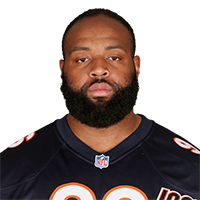 Chicago Bears defensive tackle Akiem Hicks comes in on offense and rushes for a 1-yard touchdown. 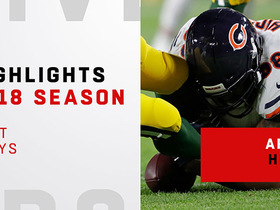 Watch every big defensive play from the Chicago Bears on Sunday Night Football. 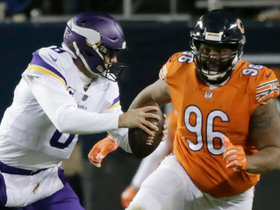 Chicago Bears defensive tackle Akiem Hicks charges through the line to sack Cousins. Minnesota Vikings wide receiver Stefon Diggs evades Chicago Bears linebacker Roquan Smith and gains 25 yards.